90% of first impressions are now made online. What's your online profile (or lack of one) saying? Developing your online presence should be at the top of your to do list. Whether you are happily employed or looking for the next opportunity, it's always a great to control your own brand. Two Way Resume makes this possible. We provide you with a stunning website, a person custom domain (yourname.com), and expert search engine optimization to get your name out there. Don't let your online presence be controlled by your unprofessional social networks, take charge of it with Two Way Resume. Every one of our themes were professionally designed from the ground up to ensure our clients have the absolute best online presence on the internet. We don't use a drag and drop editor like those other sites. You won't have to spend 15 minutes trying to get your text in the perfect position only to see that it looks terrible when you pull it up on your phone. Our system is simple, just fill out the fields (or import from LinkedIn), and our system builds your masterpiece of a site automatically. In a technology world a black and white one page resume does not convey your true skills. What if you're an artist, a writer, a musician, a graphic design, a developer? You want to showcase your work! 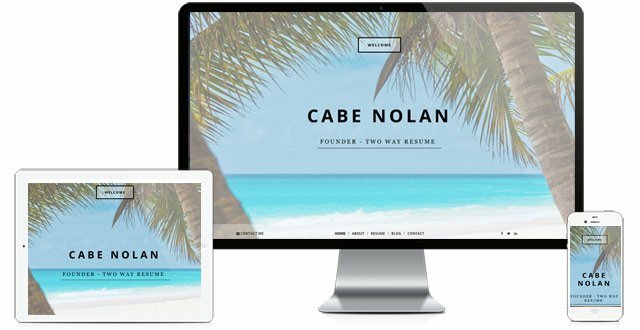 What better way then a beautiful online portfolio! Upload images, add documents for download, embed YouTube & Vimeo videos. Along with a great portfolio why not share your day to day experiences? Let employers get a feel for YOU! Write blogs posts to keep your website updated with fresh content. It's all possible with Two Way Resume. In the end, it's all about advancing yourself. Whether you strive to expand your personal business, your freelance work, or your looking for the next great opportunity in corporate America, Two Way Resume will get you there. Developing your online presence and brand is the single most impressive tool recruiters look for, and it can take you less than 10 minutes to do! Don't wait until the future, don't wait until you really start looking for a new job. The time to act is now!